Despite managing to cut the margin to just two goals at half-time, Coburg were on the wrong end of a 47-point defeat on Saturday afternoon at Piranha Park. When the Lions stuck to their structures and played the White Ribbon Round game on their terms it was exciting to watch, but an early blitz from Werribee hurt Coburg the most. The visitors managed to keep Coburg goal-less in the first term, in turn opening the game to a six-goal margin at quarter time. As Coach Leigh Adams criticised the Lions for “playing like individuals who want to be on TV” at the first break, the spray seemed to flip a switch in his young side. The second term was a much better display of the Lions’ capabilities, as the strong winds became a big advantage. 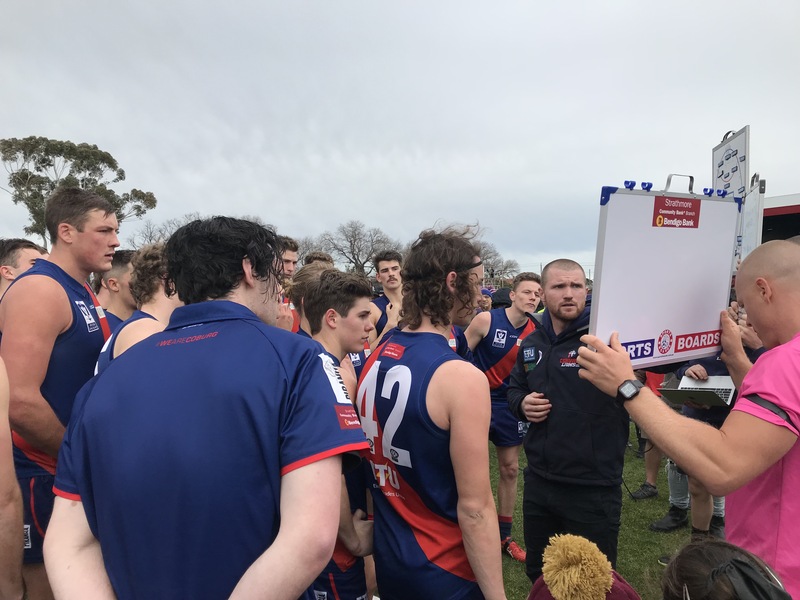 Coburg restricted Werribee’s scoring, adding just four points that term, while the Lions went on to kick four majors through Sam Lowson (2) and skipper Tom Goodwin. While the half-time margin was within two kicks, the change of ends meant Werribee were kicking in favour of the wind again. Despite this, Coburg did their best to defend the fast footy Werribee was playing, and tried to intercept as much as possible. Still in with a chance halfway through the third quarter, Werribee ended Coburg’s hopes of a comeback by kicking two goals late in the third, and storming home five goals to two in the last. Things also didn’t help when fan favourite forward Hisham Kerbatieh suffered an ankle injury, spending the final term on the bench. One highlight was debutant Billy Kanakis kicking his first senior VFL goal, after a rogue bounce fell right into his path. Coach Leigh ‘Patch’ Adams was quite disappointed with his side’s efforts, knowing that they have the talent to play much better and much stronger than this. He also acknowledged there was a big drop in intensity and pressure compared to previous weeks. “We just didn’t come with the mindset to compete today, and we’re a pretty average team when we don’t do that,” he said. Patch still saw the second quarter and early third quarter efforts as positives however. As the season nears a close, the Lions will continue to work on the areas that need improving and look to finish the year on a high. Surrounded by the hype of the proposed rule changes, the match itself saw little, if any change to the pattern of play; the main difference being the ball could be driven outside-50 from a single kick-in. He also felt the introduction of starting positions at each centre bounce didn’t have too much of a sway on the game, but did affect the way teams could respond during play. Next weekend Coburg travel to Preston City Oval to take on the Northern Blues from 2pm on Saturday. Goals: Lowson 2, Kerbatieh 2, Goodwin, Guthrie, Kanakis, Weightman. Best: Exon, Allan, McDonald, Iacobaccio, Bernacki, Gregory.